Mom Marina a visiting alumna of Georgia Tech wrote: "I recently visited my Alma Mater – Georgia Tech. I was pleasantly surprised by a new room in the Student Center. I noticed this sign at the door first. Could it be what I think it is? A Nursing room?... 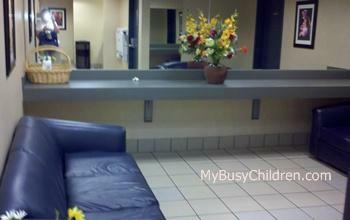 I stepped right in and found a comfortable, nicely decorated room designed for nursing Moms." Georgia Tech stated: All of the nursing rooms are equipped with a glider rocker chair, a table, great lighting, refrigerators, and cleaning supplies. There's also Medela hospital grade breastfeeding pumps available, but student mom's and employees must have their own pump accessories.